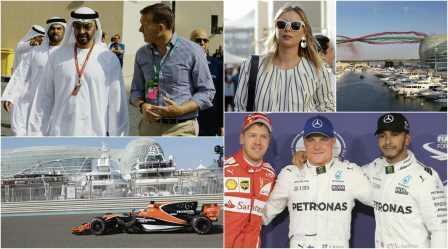 A raft of stars, including tennis ace Maria Sharapova and former Spice Girl Geri Halliwell, checked out the action on Saturday ahead of the final race of the 2017 Formula One season at Abu Dhabi's Yas Marina circuit. This is its ninth year on the calendar and Lewis Hamilton and Sebastian Vettel have been the most successful drivers here with three wins each. And as another all-time lap record fell on Friday, with Mercedes driver Lewis Hamilton beating his own benchmark from 2011 in FP2, which up to now had been the fastest-ever lap of the spectacular circuit, Sunday's floodlit dusk-to-dark race will have plenty more to offer. Mercedes driver Valtteri Bottas sounded out a warning to Ferrari's Sebastian Vettel that he won't go down without a fight, by seizing pole position for the Formula One Etihad Airways Abu Dhabi Grand Prix. The Finn, who is battling Vettel for second in the Drivers' Championship, heading into the season-finale, lapped the 5.55km Yas Marina Circuit with the quickest time of 1:36.231 seconds, with nine minutes left in Saturday's qualifying. The 28-year-old, who is 22 points behind Vettel, clinched his second consecutive pole position and the fourth of his career. Bottas also put to shade last year's pole-winning lap by two-and-a-half seconds and will be gunning a third win this season after victories in Russia and Austria. Mercedes locked out the front row of the grid with Bottas' teammate Lewis Hamilton second, the freshly-minted four-time world champion, 0.172 seconds behind. The Briton, who wrapped up his fourth world title in Mexico, mustered a fastest lap of 1:36.403 seconds, also with nine minutes remaining. Vettel, who won the penultimate race in Brazil, could only manage third, with a time of 1:36.777 seconds, after the chequered flag had fallen on the session. Red Bull's Daniel Ricciardo, who is tussling Ferrari's Kimi Raikkonen for fourth in the Championship, got one over the Finn, with one final dash of 1:36.959 seconds. Raikkonen was fifth with a timing of 1:36.985 seconds. The Australian is on 200 points, while Raikkonen is seven points adrift. Ricciardo's teammate Max Verstappen was sixth followed by Renault's Nico Hulkenberg. Force India's Sergio Perez qualified eighth, while teammate Esteban Ocon was ninth. Brazilian Felipe Massa, taking part in his 269th and final race of his career, rounded out the top 10, in the Williams. McLaren-Honda's Fernando Alonso was 11th. Earlier, Ericsson was the first man to record a lap time, with a 1:40.692s. Bottas exited the garage two minutes into the session even as Hamilton set the fastest time of 1:37.473, 0.2s ahead of his teammate. Meanwhile, Vettel was third, 0.7s behind Hamilton but Raikkonen took his teammate's spot, 0.1s quicker, than the German. It was pretty much cat-and-mouse with the top spot changing hands between Bottas and Hamilton. Haas' Romain Grosjean, Toro Rosso's Pierre Gasly, Sauber duo Pascal Wehrlein and Marcus Ericsson and Toro Rosso's Brendon Hartley were eliminated after Q1. Bottas went fastest at the start of Q2 with a time of 1:36.977s but Hamilton chipped away, going 0.2s quicker. Meanwhile, it was an interesting battle between Alonso and Massa with the latter edging ahead with a strong run. Joining Alonso out of Q2 were Renault's Carlos Sainz, McLaren-Honda's Stoffel Vandoorne, Haas' Kevin Magnussen and Lance Stroll in the Williams. Q3 began with Raikkonen setting a blistering 1:36.985 seconds but the Finn's compatriot Bottas was even faster to take provisional pole. And it went on to stay that way for Bottas denied Hamilton a 12th pole position this season. Earlier in the afternoon, Hamilton topped the timesheets in the third and final practice session. It has been three days of exhilarating speed and even racier concerts once the chequered flag has come down and tonight, the jewel in the crown, Pink, will be signing off on another Yasalam at the 2017 Abu Dhabi Grand Prix. The line-up for the du Arena concerts has read like a diversity programmer's dream with EDM, hip-hop, folksy hipster vibes and pop rock being represented by Calvin Harris, J. Cole, Mumford & Sons and Pink respectively. Walking round Yas Marina over the weekend, the festival feel has been intoxicating this year. Pop-up art exhibitions by the Opera Gallery, circus performers on stilts wearing LED lights, free Panama hats for every visitor, the sound of a live saxophonist playing over dance hits at the House of Debonair and of course, the many billions of dollars on display in the form of yachts and oligarchs' wristwatches have merged in the fine winter weather to create a snapshot of traditional racing fun and glamour. Although unlike most events of this scale, the planning has been meticulous with the ease of getting people around the island taking high priority. Okay, that's not very rock and roll to mention, but our appreciation is too great to ignore. Thursday evening's Calvin Harris gig set the right notes music-wise. The Scottish DJ opened his set with Sweet Nothing, going on to perform a series of chart-topping hits such as This is What You Came For, Despacito, How Deep is Your Love and Summer. Pyrotechnics and light shows added to the frenzied atmosphere. Last night Mumford & Sons had the crowd swaying and jigging with their hits including the ever-popular I Will Wait and, to top it all, the grungy yet soulful superstar Pink's show tonight from 8pm is sure to blow the lid off a great Formula One weekend.